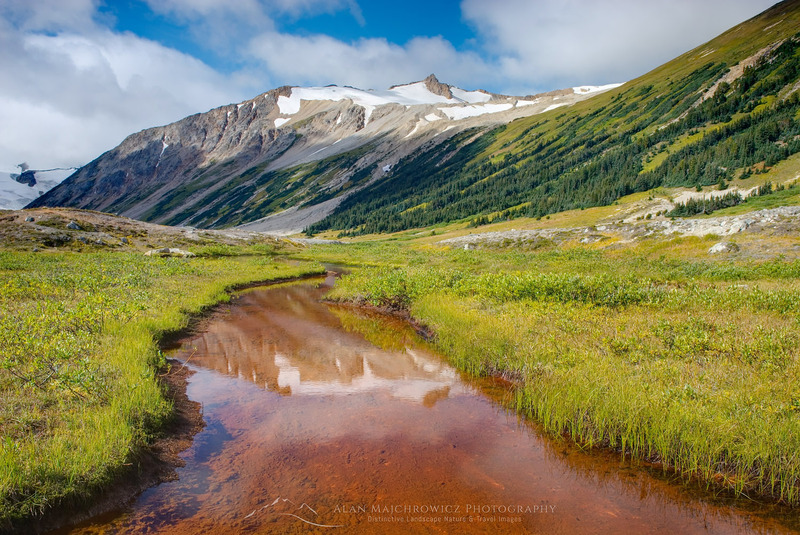 Last month I made my third trip into Marriott Basin, in search of new landscape images. 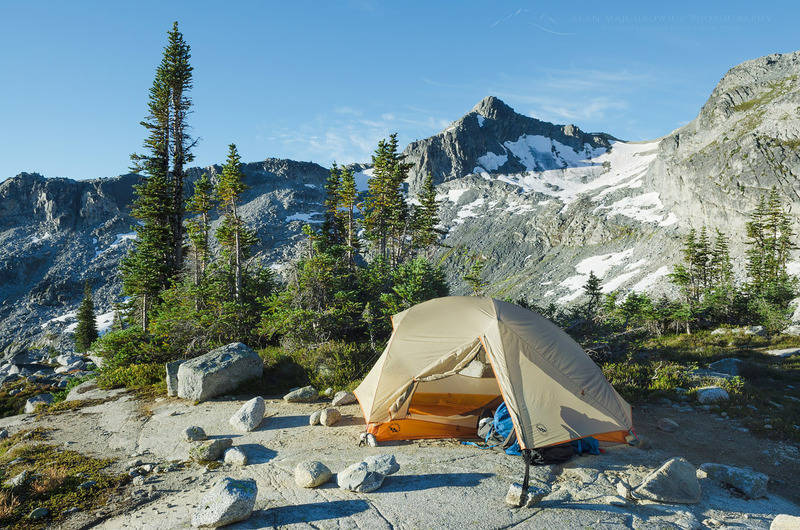 Hot on the heels of my recent trip to Whatcom Pass, I wanted to get in as many backpacking photo trips as possible before wildfire smoke returned. This season has been one of the worst in history for wildfires. Both in the western United States and British Columbia numerous large fires are burning. 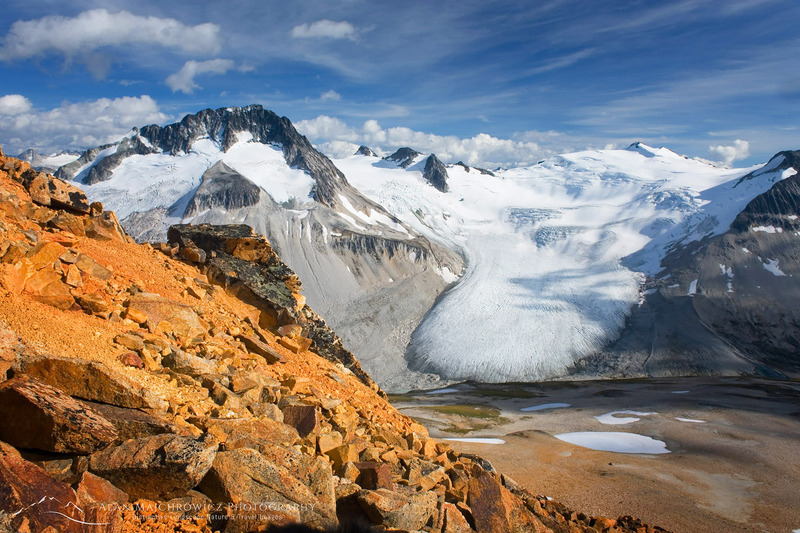 Located in the southern Coast Mountains of British Columbia, Marriott Basin is an extensive alpine area. 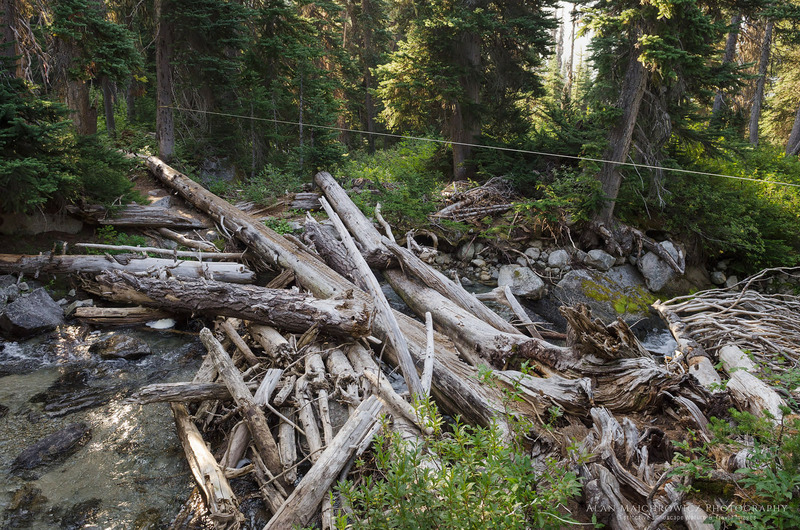 Access to the area is from Cayoosh Pass on highway 99, about an hour’s drive east of Pemberton. 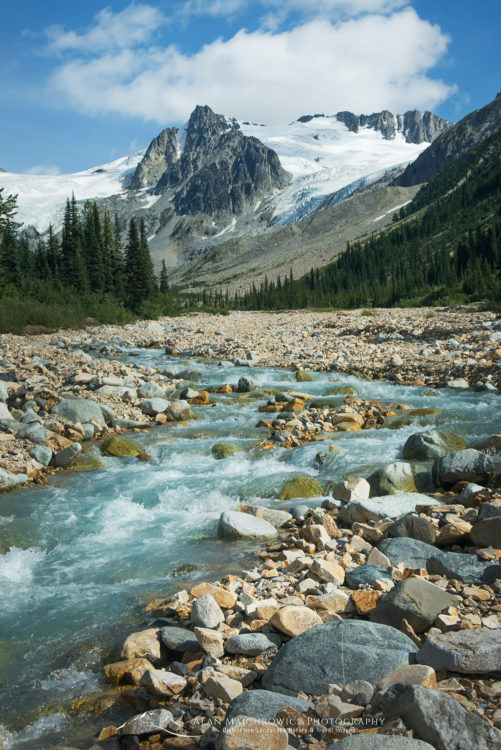 Nearby is the extremely popular Joffre Lakes Provincial Park. 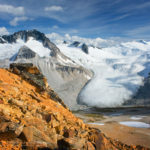 While the lakes are popular with sightseers and day hikers, the Joffre Group of peaks is wildly popular with climbers and backcountry skiers. 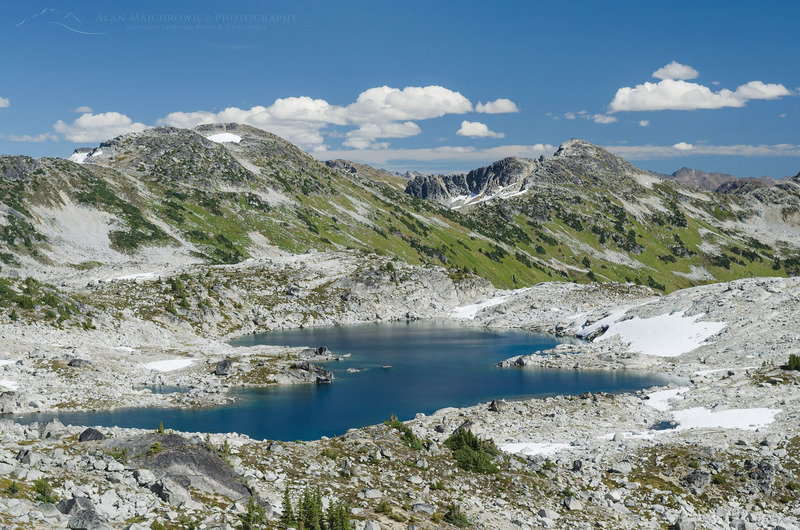 Generally above 6000′ Marriott Basin contains several lakes and numerous peaks for climbing, most notably Marriott Peak. 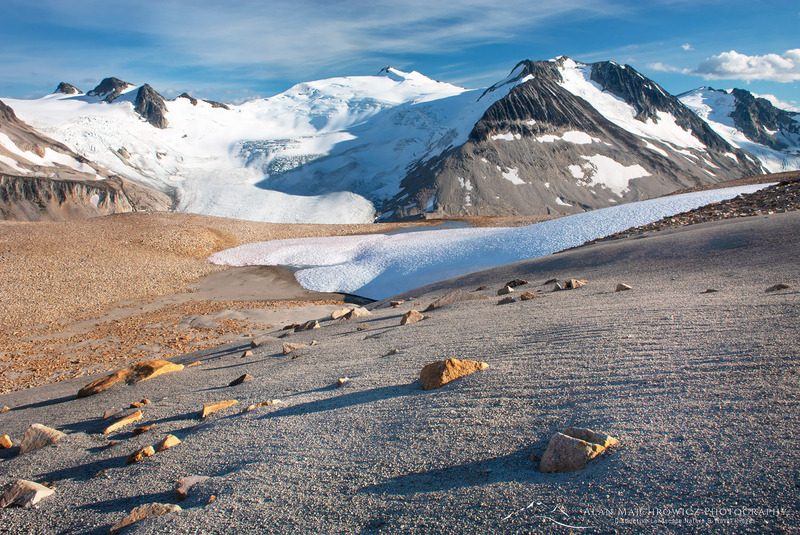 My previous trips to Marriott Basin entailed one overnight backpack to Mount Rohr, technically outside the basin. 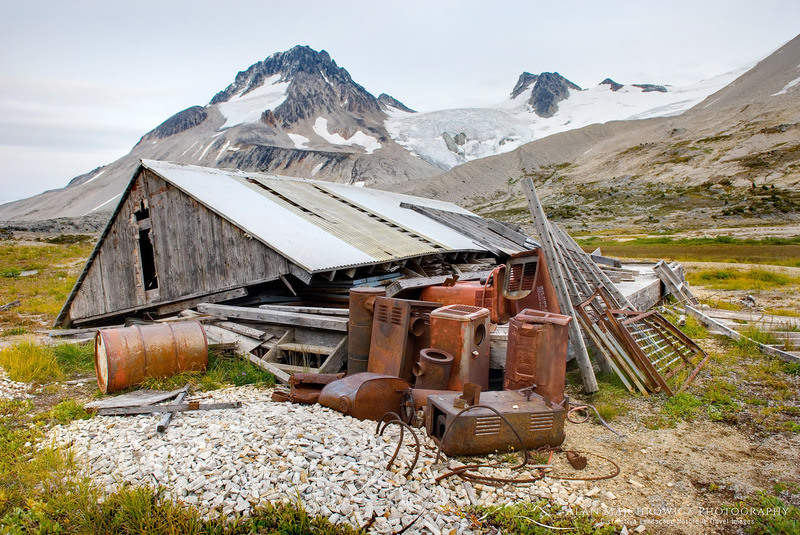 The other was a winter ski trip to the Wendy Thompson Hut, located at the head of the basin. 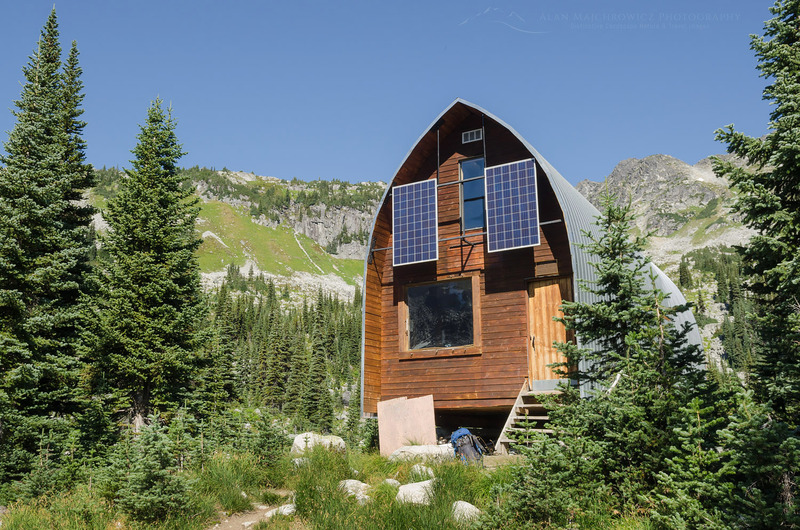 The Wendy Thompson Hut is operated by the Alpine Club of Canada and is open year round. However, the hut sees most of its visitors during the winter and early spring ski season. Getting into Marriott Basin is fairly straightforward, with summer access being slightly different from winter. In summer you can drive a couple of miles up a brushy gravel secondary road to the trailhead. Parking and turnaround space is extremely limited and you my need back down the road to find a spot. 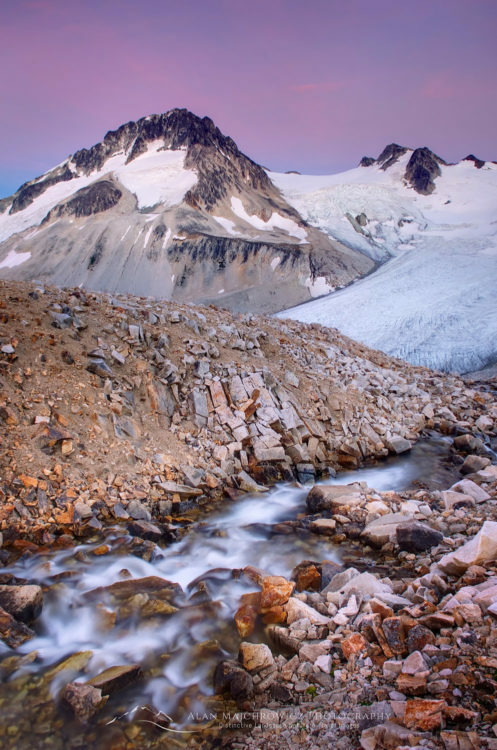 The total length into the basin from trailhead to the hut is around five miles with about 2000′ feet of elevation gain. I say around and about since I don’t carry a GPS and rely on maps and online trail guides instead. Depending on your fitness and pack weight the hike in can be from 2-4 hours. 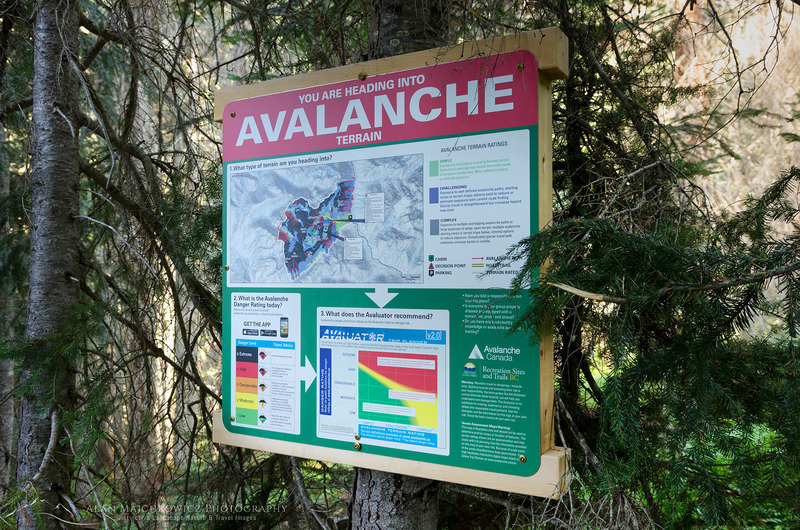 Posted at the trailhead is a large sign warning of and explaining avalanche hazards, which generally is of no consequence in summer. 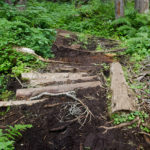 Hikers accustomed to hiking on U.S. trail in the Pacific Northwest may be in for a rude awakening. Well marked and easy to follow, the trail receives very little maintenance. Climbing over logs around boulders and muddy areas the trail is pretty rough in places. 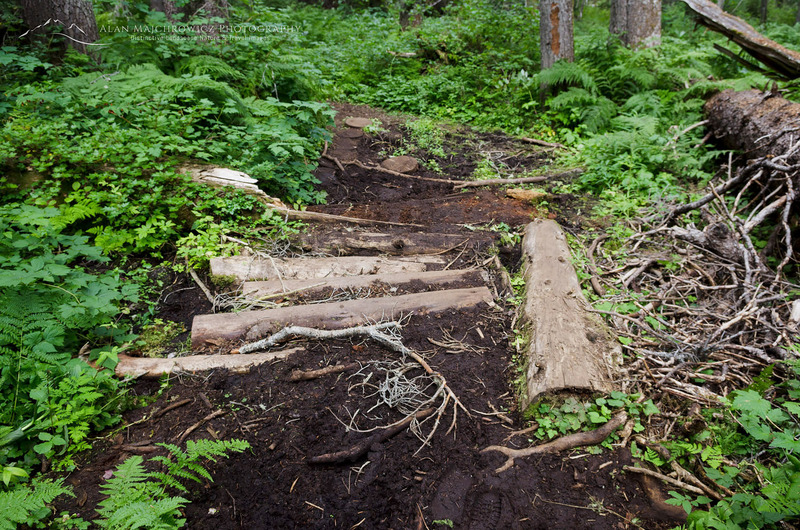 After a short level spell the trail climbs a headwall very steeply, without switchbacks, trough forest. Near the top of this section is the turnoff for Rohr Lake and Mount Rohr. From here the trail levels off a bit and zigzags around muddy bogs and small meadows until a tricky log crossing of a stream. On my visit the water was low but in late spring early summer the crossing must be quite exciting! 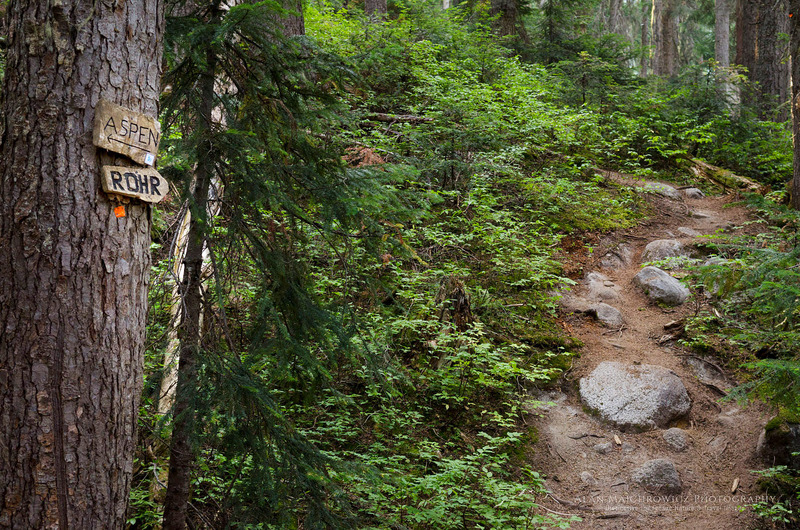 The next section of the trail climbs into the subalpine zone, or the boulder zone as I call it on this trip. As soon as you start breaking out of the trees the trail is almost constantly negotiating rocks and boulders. The constant ups and downs and zigzagging can be very tiring, especially in warm weather. However the views also begin to open up now, above to the ridge tops and over to green Marriott Lake. After reaching the far end of the lake the last bit of climbing to the hut begins. Again, depending on your pack weight this section can feel short or agonizingly long. In all it’s less than a mile and 200′ higher up. 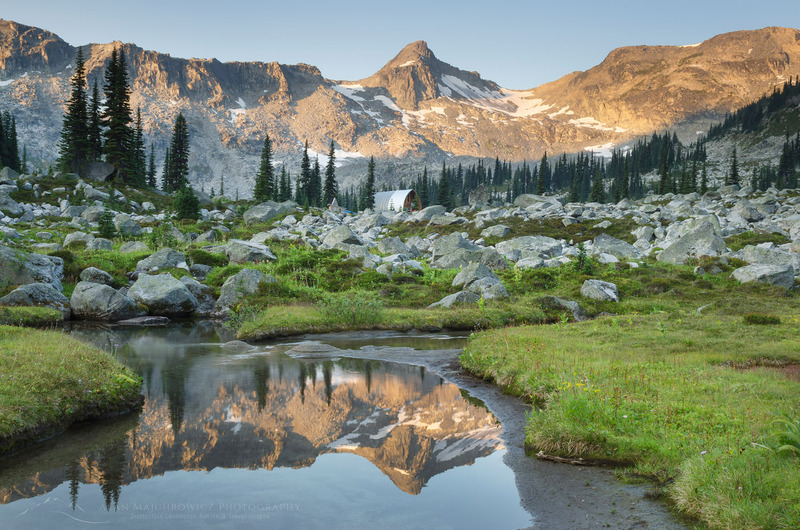 A level boulder filled meadow with a meandering stream is home to the hut. The upper lakes were my ultimate destination, so I only paused briefly for a rest and inspection of the hut. Wendy Thompson was a ski patroller and paramedic. She died tragically in 1995 at the age of 33 in a Medivac flight crash in the Queen Charlotte Islands. As a memorial and legacy to Wendy, her parents and the ACC worked with volunteers to build this hut. Since my last winter visit the ACC made some substantial renovations. They extended the entire length, added solar powered lighting and USB ports. They also replaced the obnoxious smell of kerosene heaters with a wood burning stove. As is usual in backcountry huts one of the tables was covered in maps, guide books, and misc. reading material. Also present was the obligatory cribbage board and multiple decks of cards. From the hut the work begins again. Access to the upper lakes is via more and bigger boulder fields without benefit of a trail. Some well placed rock cairns mark the way but mostly it’s a pick your own best route deal. Once at the upper lakes it wide open wandering in all directions. 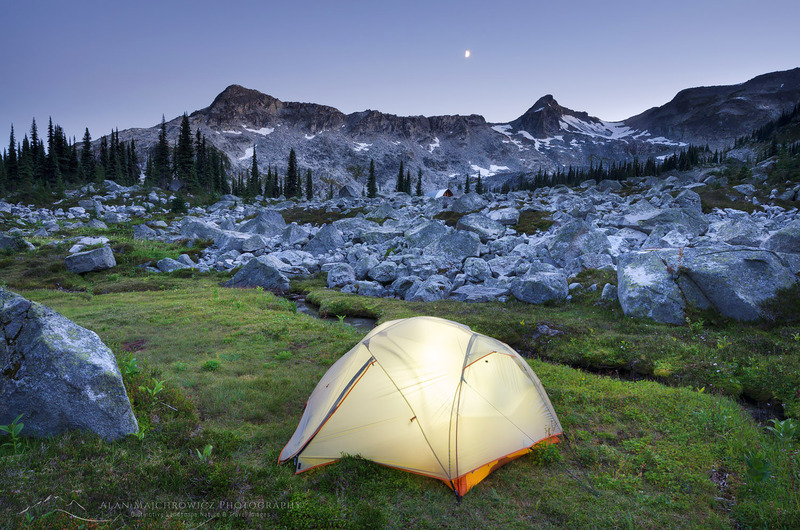 I set up camp in a spot suitable for easy access to photo ops of the distant peaks and valley below. The next day I did some exploring and I set my eyes on an easy ridge within my comfort level. Hiking and easy scrambling over boulder slopes brought me to the crest with new view to the west and north. One of the reasons I picked this particular ridge was for the unobstructed views of Cayoosh Mountain. 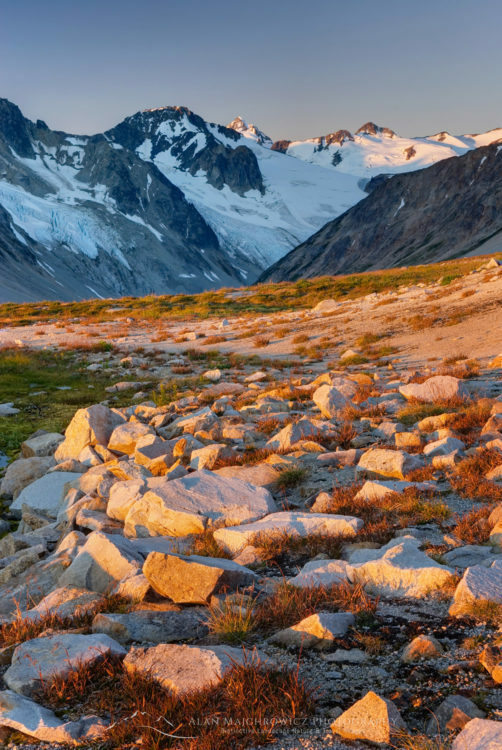 Sitting at 8200″Cayoosh is a fairly bulky chunk of rock with the north and east aspects covered in glaciers. Looking down between me and Cayoosh was a high pass with a small green lake. To the north was a long deep valley with countless peaks on the horizon. Taking in such a view I immediately wished I had my camp set up here! Photographing in good light would be spectacular. I guess I”ll have to make another trip back sometime. Later back at my camp I settled in to wait for evening light. Although the sky was mostly free of clouds, there was some nice alpenglow present which enabled me to make a few photos. It was nice to watch the progression of layered colors after sunset. First came yellows and oranges followed by purples and blues of the Belt of Venus. The next day I had planned to hike out to my truck but on exploring the area near the hut I decided to stay an extra night. Near the hut were small grassy meadows and a small stream among more boulders. I found a nice campsite near the small stream which held potential for some nice photographic compositions. I tried to make some evening photos but the light was bland, especially with no clouds. In the morning it was apparent that winds had shifted. Smoke once again began to creep across the sky. Although there still weren’t any clouds the light was a bit nicer, with the smoky haze giving a more pastel hue to the scene. I set up my tripod in a few predetermined places and came away with several more photos. I had a quick breakfast and packed up my gear. Although I wasn’t as successful with photos as hoped I did have a great time. And I did manage to find a new view that was worthy of a return trip. I actually love these types of trails, there’s a sense of true wilderness about them, unlike some of the crowded super highway trails found in Washington and Oregon. These pics are from a few days ago during a visit to Marriott Basin in the Coast Mountains. 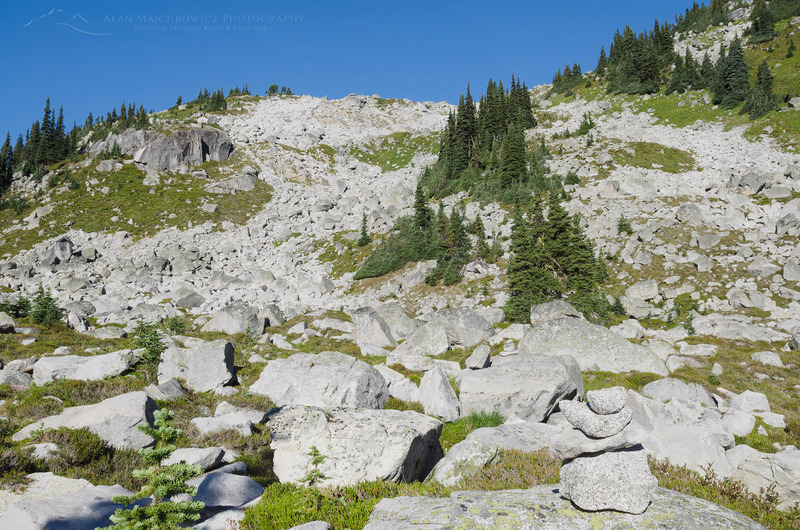 I have lots of new photos in the works from this and my previous trip to North Cascades National Park. Stay tuned you’re going to love them!! This article was originally posted back in August of 2008. 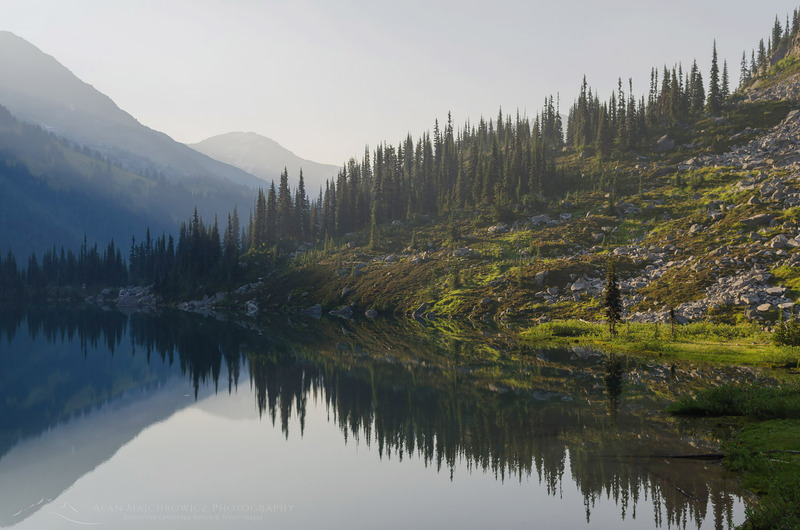 Since my main summer photography trip for 2014 will be an extended visit to several very remote and seldom visited areas in British Columbia, I felt it appropriate to bring this one back to light. 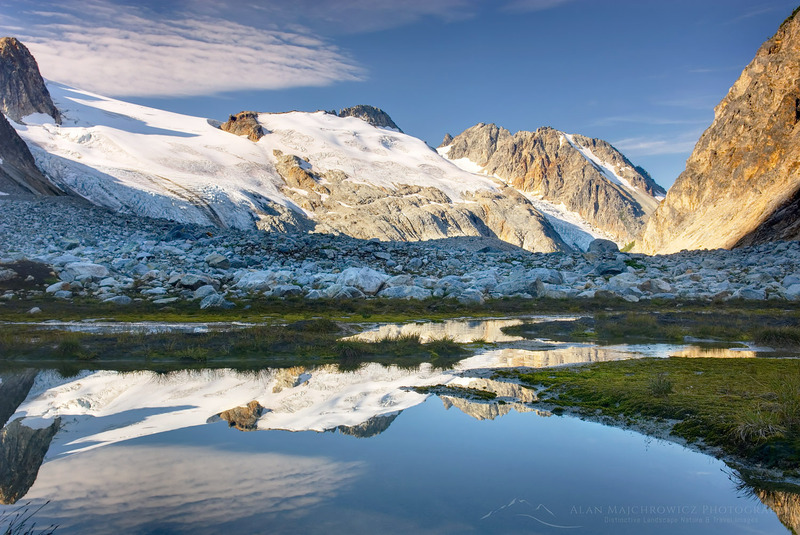 To date this trip to the Athelney Pass Coast Range British Columbia was one of my favorite and exciting in recent years. 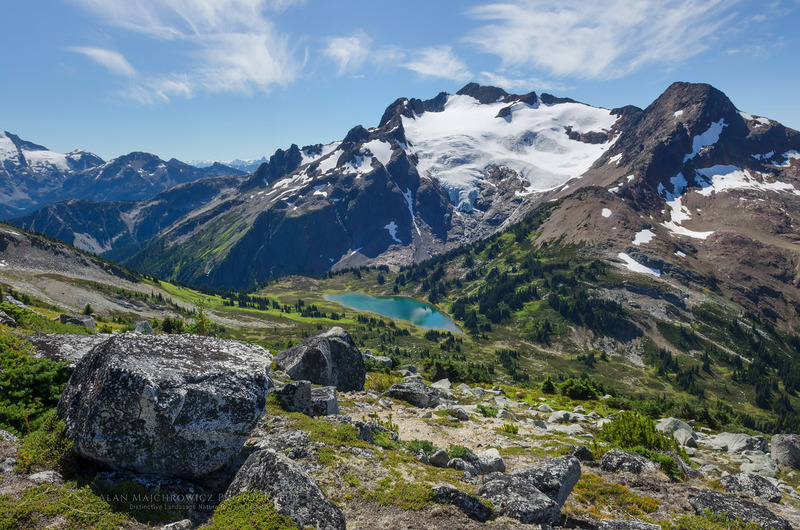 Despite an abundance of National Parks and Wilderness Areas in the Pacific Northwest, it is getting harder every year to find a place to visit and photograph that is relatively unknown and has a truly remote wilderness feel to it. 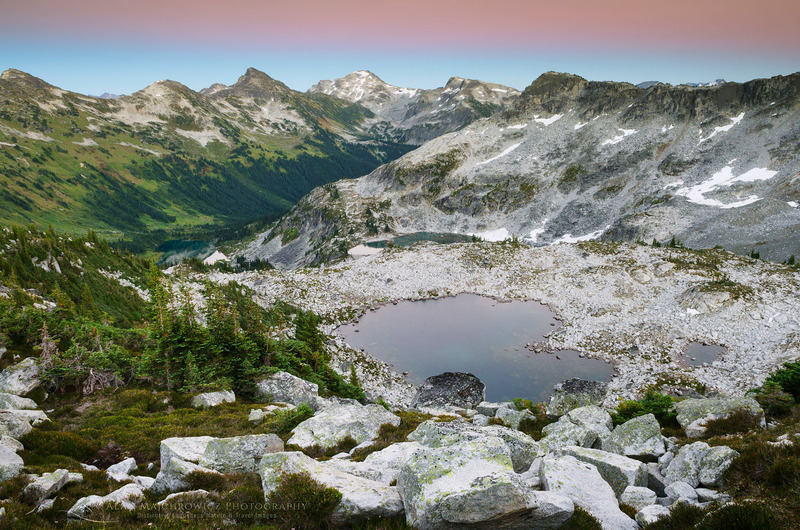 The Athelney Pass/Salal Creek area fits the bill in all aspects, even though it has no wilderness park or protected area designation. For the last six days I’ve been working on editing all the new images from my recent trip to Athelney Pass in British Columbia’s Coast Range. This trip was one of the best and most productive amongst a string of excellent photo trips in 2008. So it’s worth adding a few words and pics about it. I was vaguely aware of this area until early last month while researching nearby Coast Mountain routes and trails on the web. It only took seeing a couple of photos on Google to convince me to make a trip there. Researching Athelney Pass in a couple of guidebooks revealed that it wasn’t too far away. Just a 4-5 hours drive north from Bellingham. I felt four-six days would provide ample time for exploration and photography. 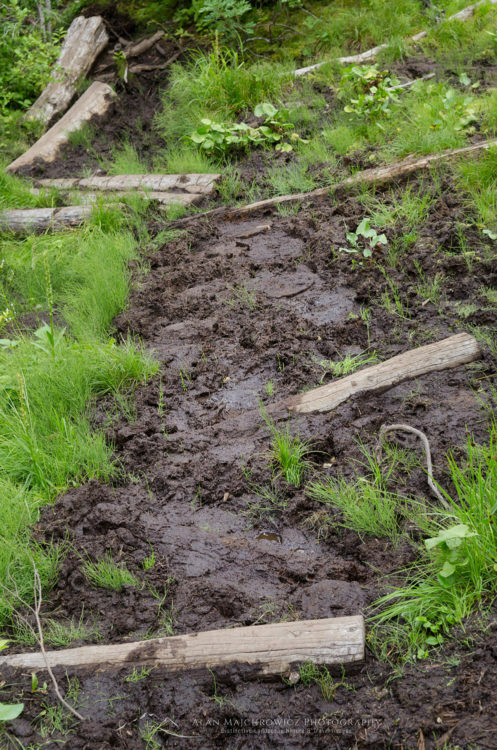 Unfortunately (or maybe fortunately) there is no formal trail leading into this rugged wilderness. Meaning that while the hike to Athelney Pass is only a modest 8-10 or so miles in length and 2200 feet elevation gain. However it felt like it was about twice that much. As an added bit of excitement I came across a very large Grizzly Bear on the road as I was driving out after the hike. I’ll never doubt the speed at which these animals can run. I was driving a gravel road when it burst out of the brush in front of my vehicle. It took off down the road at an accelerating speed before disappearing into the brush again. So if you are looking for a new place to go hiking away from the crowds with a true feeling of raw wilderness, and don’t mind putting in the extra effort this area might be for you. All photos are available for purchasing as prints or for commercial licensing. Just click on the desired image and then click Add to Cart to select your option. Thanks, and please share if you like it!